FOR THE eight Aboriginal players on Port Adelaide’s list, the journey to the Port Adelaide family is one very special. It’s a journey expressed in Port Adelaide’s 2016 Sir Douglas Nicholls Round jumper – ‘Bambara’ – designed by third-year forward Karl Amon. 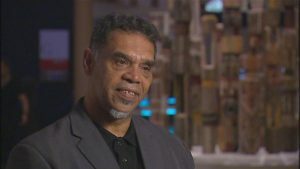 In keeping with the tradition of wearing an Aboriginal jumper design each season, Amon was invited by the club to create a design that represents his language group. It makes him the first player to design a guernsey for the Port Adelaide Football Club. 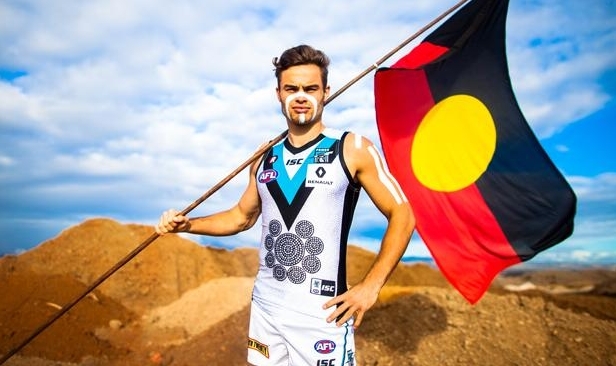 “Bambara means ‘journey’ in my language group, which is the Jandai language group from the Noonuccal people on North Stradbroke Island,” Amon told portadelaidefc.com.au. In designing this guernsey, Amon becomes the first player to design a jumper for the Port Adelaide Football Club. 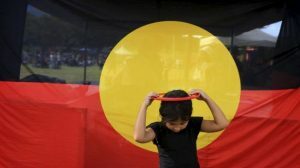 Previous Aboriginal-themed jumpers have been designed by Jake Neade’s community in Elliott, Brendon Ah Chee’s mother Valerie and Chad Wingard’s grandmother Barbara. “The small circles represent the eight players on our AFL list, the larger circle represents the club, which is the coaches, other players, staff and volunteers,” Amon explains. “I didn’t leave off the supporters either, they’re represented by the smaller dots around the outside. Port Adelaide has also translated its official club song into Pitjantjatjara language to be played as part of its Round 10 game against the Demons.